A kit to make old "paintings" in beautiful fall colours. 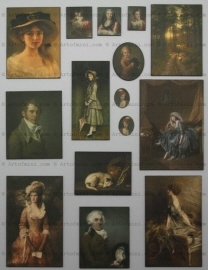 This kit includes laser-cut parts that match to the measurements of the paintings. It is up to you if you want to frame these paintings or just let them be the way they are. Both options are amazingly beautiful! They can be used in any time period, but certainly in an antique shop, a shabby scene, a men's room, an autumn scene or just standing against a wall. Due to the beautiful colors, this kit has a very large number of options.